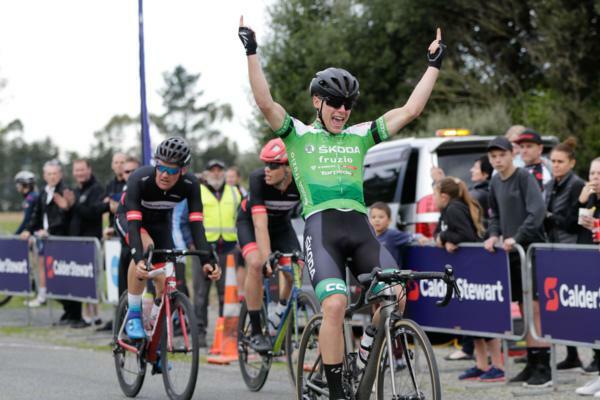 After only a month back on the bike after fracturing his back in a collision with a car in late January Southlander Corbin Strong won today’s elite men’s 139 kilometre race in round four of the Calder Stewart Cycling Series in Timaru. One of New Zealand's most promising young cyclists, 18 year old Strong (Team Skoda Fruzio) fractured his T1 vertebra in a nasty collision with a car while out training and was off the bike for eight weeks but was still selected for the Junior Track Cycling World Championships in Switzerland in August. “It was a tough start to the year for sure so it’s pretty cool to get my first win in the elite race in the Calder Stewart Series,” Strong said. Seven riders got away at the end of the first lap of the 46 kilometre circuit the elite men completed three times. The break contained Dunedin’s Kees Duyvesteyn (NZ Cycling Project Ricoh) who as well as leading the Under 23 classification was second overall on the points table only seven points behind leader Matt Zenovich (Transport Engineering Velo South). This saw Transport Engineering Velo South go to the front to work to control the break and they were assisted by PKF Waterproofing Concepts and Mike Greer Homes. With one lap of 46 kilometres left the break still held a five minute advantage but a strong effort from the chasing bunch saw them caught with four kilometres left to race. Team Skoda Fruzio’s Finn Fisher-Black took a flyer with two kilometres to go but was quickly reeled in with Strong claiming the win in the Kiwi Style Bike Tours Timaru Classic in three hours and fourteen minutes from Paul Odlin (PKF Waterproofing Concepts), who took the elite men’s series lead off Zenovich who finished mid pack, and Strong’s team mate Lachie Dickson. Strong’s win saw the Under 19 jersey stay with Team Skoda Fruzio swopping from Fisher-Black to the day’s elite winner. Jono Stewart (PKF Waterproofing Concepts) did enough to claim the Small Business Accounting jersey. Elyse Fraser (Velo Project) won an aggressive women’s 92 kilometre race managing to get away with 14 kilometres remaining. She was joined by the series over 35 classification leader Jeannie Blakemore (Cycle Surgery Bartrams) who attacked the chasing bunch and managed to get across to Fraser and the two worked well to stay clear to contest the finish. Fraser, who was part of the national endurance track squad last year, paid tribute to her team that included Kirsty McCallum who was fourth equal with Niamh Fisher-Black (Mike Greer Homes) which was enough to take the series leader’s jersey off Fisher-Black’s team mate Ella Harris who was eleventh. To complete a successful day for Velo Project Sharlotte Lucas won the bunch sprint to take third, finishing just over one minute behind Frasers winning time of two hours and 28 minutes. “It really was a real team result which wouldn’t have been possible without the good group of girls behind me,” Fraser said. Velo Project are leading the team’s classification ahead of Mike Greer Homes and to complete their strong showing Ally Wollaston will take the Under 19 leader’s jersey into the series’ winter break. Kate McIlroy (Lightworkx Photography) retained the Small Business Accounting Queen of the Mountain’s series jersey. Invercargill cyclist Neil Cleghorn (Armstrong Prestige) had his first win in the masters racing after escaping the bunch with 10 kilometres to go and soloing to the finish to win in two hours 11 minutes. Cleghorn is no stranger to elite racing having competed at elite level nationally and overseas in the past and has recently got back into cycling after an effort to get fit again. Chris Karton (Heartland Ricoh Cycling) won the bunch sprint over David Rowlands (Christchurch Mitsubishi) and Justin Sims (Armitage Williams) to claim second, nine seconds behind Cleghorn. Darryl Kircher (Christchurch Mitsubishi) finished fifth but was the first over 50 rider home earning enough points to take the over 50s series leaders jersey off Chris Latta (Cycle World Emersons). Karton built on his lead in the 35 to 44 age group over Blair Martin (Cycle World Emersons) and Glenn Rewi (Christchurch Mitsubishi) while Rowlands also strengthened his grip on the 45 to 49 leader’s jersey and the Small Business Accounting King of the Mountain jersey. The Calder Stewart Cycling Series takes a winter break with the next round being held in Nelson on 22 September.